Earlier this month, CleverTap had the pleasure of participating in the inaugural Mobile World Congress Americas in San Francisco. Paul Brody, CleverTap’s Chief Product Officer, was a speaker at the event. He presented a topic at the cutting edge of mobile growth and data science: machine learning. We’re excited to share key highlights from his presentation. Machine learning (ML) is the ability for computer programs to analyze big data, extract information, and learn from it. Essentially, it gives machines the ability to learn and adapt through experience. Here’s how it works: the system uses probability to make decisions or predictions based on the available data. It then uses feedback loops to find out if its prediction was right or wrong. Predictions get more and more accurate — and the system gets smarter. How is ML relevant to mobile marketing? 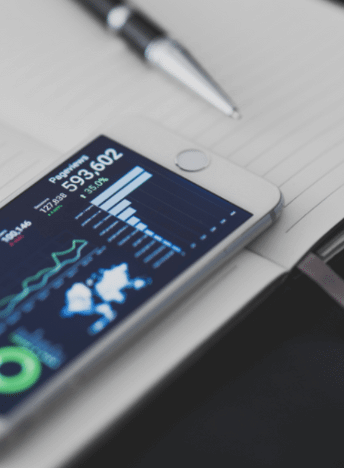 Tools like CleverTap collect a huge amount of data — from user profiles, location, and usage stats, to which features users are interacting with, and much more. But on its own, this data only tells us what happened in the past. Machine learning, on the other hand, uses this information to predict the future. Data is useless if it doesn’t help you make better decisions in the future. When predicting churn, most mobile marketers use a combination of intuition and historical data to come up with a rule — typically one that’s simple and doesn’t change much over time. Reduce your customer churn by identifying the potential churn in advance and engaging them. But rules-based marketing is only as smart as the human operating it. Hidden patterns and complex relationships are all too easy to miss, or misunderstood by brute force data exploration and domain expertise. Machine learning, on the other hand, can see all of the available data — and the relationships hidden within. The majority of ML algorithms (except neural nets) are not black boxes. They not only provide predictions, but also the reasons or key variables behind the predictions. Armed with more complete information, mobile marketers can better act on data-based insights. This is the most basic form of simplified ML algorithm: a decision tree. 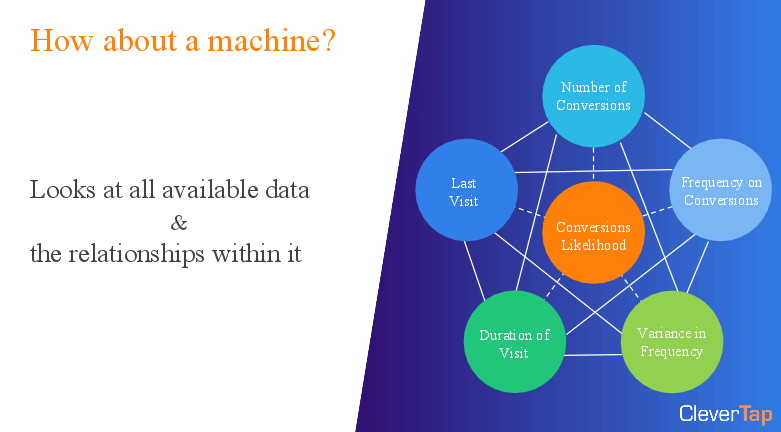 If the last visit is more than 10 days ago, the next most important variable is conversion. But if the last visit is less than 10 days ago, the most important variable is duration. It all boils down to a series of probabilities about whether people will convert. The typical mobile marketer uses less than 5% of their available data to make decisions. Between tracked events (user activities) and user characteristics (properties), the typical mobile app may have 250-500 classes of available data. In our experience, marketers will leverage just 2-25 of them. Let’s look at a use case of a large ticketing company with millions of downloads and ticket transactions and 10 million active users. 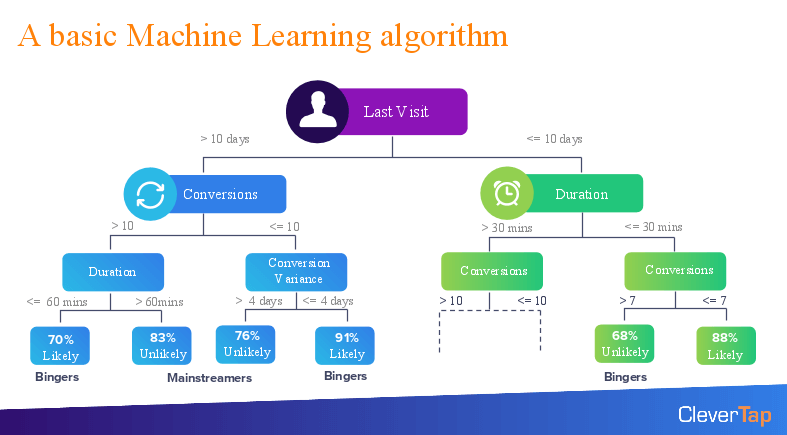 Using CleverTap’s ML, marketers can predict a user’s likelihood to buy and create mutually exclusive audience segments. From there, marketers can engage each segment more effectively. Using qualifiers such as frequency of app visits, the variance between these different frequency levels, and a few other measurements, we discovered users were most likely to transact every 15 days. Without ML, every user looks the same. All 10 million users were receiving the same message — and only 1.2% converted. When we apply ML to those same 10 million users, it’s no longer a monolithic whole. Since we can check this model using historical data, we now know with a high degree of accuracy which 200k users are most likely to convert, which 400k are likely to convert, and which 6.6 million are unlikely to convert. Before ML, the company converted 1.2% of users — roughly 100k users. With ML, the company can now immediately identify an additional 500k users who are likely to convert. This is a huge opportunity — and we can know this in advance. We’re predicting the future. Now we can market to each segment differently. ….and the results keep getting better over time. Add a marketer’s expertise with the power of machine learning and you have the winning formula. Click here to watch Paul’s entire presentation on Machine Learning for Mobile Marketers.